Back in 1984, a rebellious,17-year-old, punked-out Ulli Lust set out for a wild hitchhiking trip across Italy, from Naples through Verona and Rome and ending up in Sicily. Twenty-five years later, this talented Austrian cartoonist has looked back at that tumultuous summer and delivered a long, dense, sensitive, and minutely observed autobiographical masterpiece. Miraculously combining a perfect memory for both emotional and physical detail with the sometimes painful lucidity two and half decades' distance have brought to her understanding of the events, Lust meticulously shows the who, where, when, and how (specifically, how an often penniless young girl can survive for months on the road) of a sometimes dangerous and sometimes exhilarating journey. Particularly haunting is her portrait of her fellow traveler, the gangly, promiscuous devil-may-care Edi who veers from being her spunky, funny best friend in the world to an out-of-control lunatic with no consideration for anything but her own whims and desires. 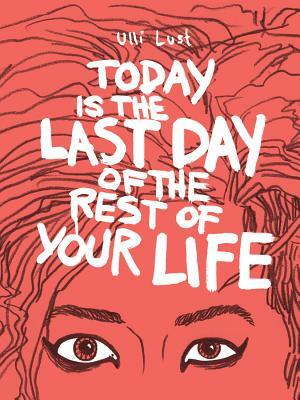 Universally considered one of the very finest examples of the new breed of graphic novels coming from Europe, Today is the Last Day of the Rest of Your Life won the 2011 Angouleme "Revelation" prize, and Fantagraphics is proud to bring it to English speaking readers.